Another staple in a Korean meal is soup. No matter what kind of food you are having, or where you are having it, chances are there will be some kind of soup on the table. We just love our soups. And half the time it will be some variation of Korean miso soup. 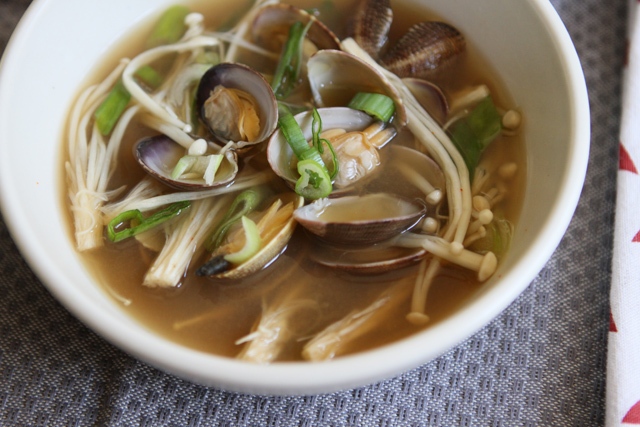 Today we will be making it with Manilla clams. 1. 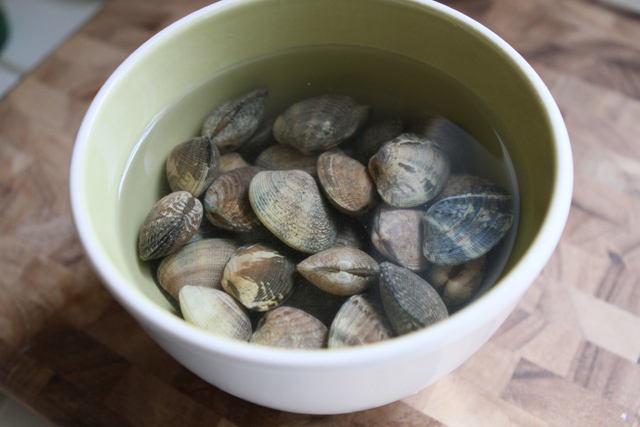 Prep the clams: discard any clams that are open and scrub the rest under running water. Then soak in water for half an hour. 2. 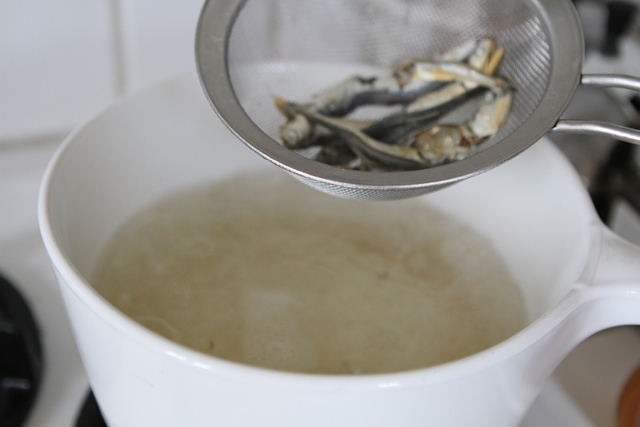 Start the broth: bring 5 cups water and the dried anchovies to a boil. 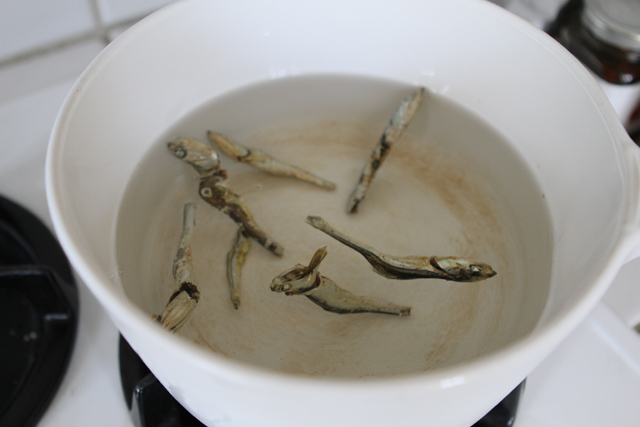 Lower heat then remove anchovies after 8 minutes. 3. 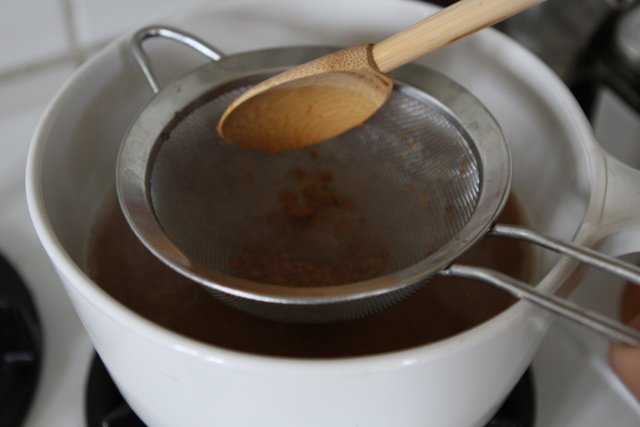 Lower the heat and add soybean paste to the broth by pushing it through a strainer with a spoon. We do this so the soup is smooth without any bits of bean floating around. Discard the chunks that don't go through the strainer. 4. Add the garlic and clams to the pot. 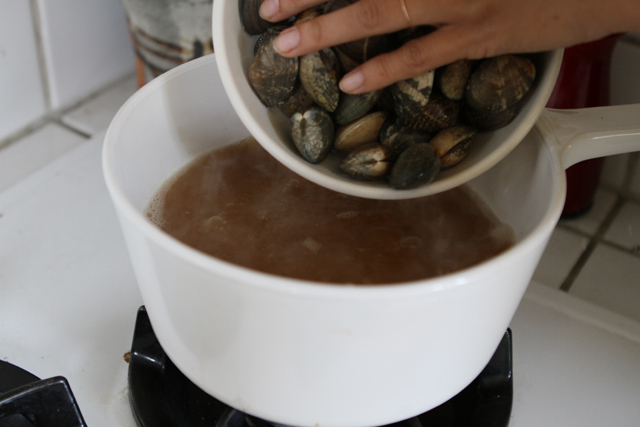 Bring to boil for a minute then let simmer on low until the clams are all open. 5. Add the enoki mushrooms, green onions, jalapeno slices, and red pepper. Let cook for a couple minutes or until the veggies are slightly wilted. 6. 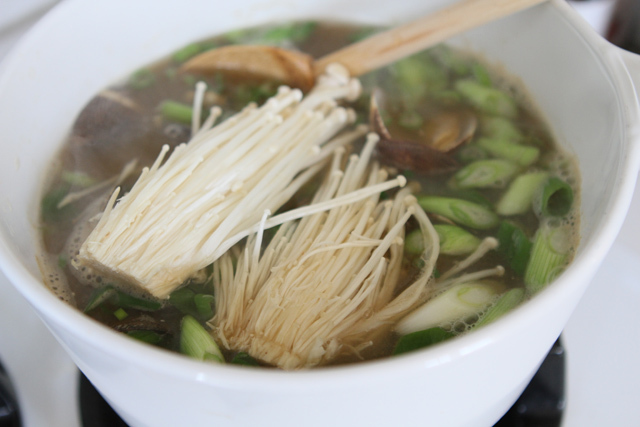 Serve into bowl and top with some green onion slices for garnish. Enjoy! This looks so good, will have to try it. Thanks! Can we substitute something in for the clams? I cannot eat clams unfortunately. This looks very good- I look forward to future recipes :). The simplicity of your nstructions are excellent for someone who is not so good in the kitchen like myself! Tofu is always a good alternative. Hope you like it. spinach is a good alternative too! Thanks and good luck with this new project! This blog is my new obsession! Thanks so much for the two of you bringing it ot life! Sadly my town has no Korean grocery, but a plethora of Japanese ones so ... hopefully I will find some close substitutes! Who makes that white enamel pot? Thanks! the white pot is vintage. i found it at a thrift store! Perhaps post the Korean names of the recipes? It will be extra educational that way. That's a great idea. I think we will start adding the Korean names to the recipes. Woohoo! My friend just referred me to this blog. As a Korean living in LA (newly transplanted from SF, by way of the Central Coast, followed by Connecticut), I'm stoked to see a fresh approach to Korean food. Maybe this will motivate me to open up my Korean cookbook, or ask my mom for her recipes. Keep it up; I look forward to reading! Beautiful blog. What a promising start. Cant wait for the next instalment. I am so excited about your new blog---Please keep it up and keep posting! this dish looks so good and comforting! Damn! That looks easy and delicious. 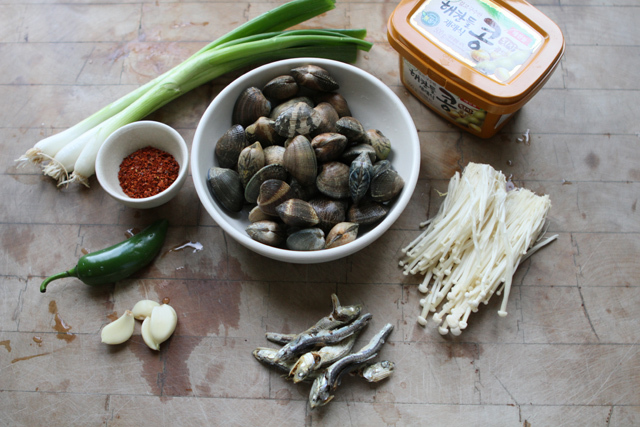 I'm going to make it tonight for dinner (my man loves korean soups)This is my kind of recipe. Thanks!